The Kengnan site, dating to the Palaeolithic period, is located in the southwest of the Nanyang Basin and the second-level terrace on the left bank of the Dan river, the largest branch of the Han River. The Kengnan village and Wuying village, Madeng town, Xichuan county, Nanyang, Henan, are located to its east. The Kengnan site supplied important basis for exploring the transition from the Palaeolithic period to the Neolithic period around the Nanyang Basin. The No.1 location of the Kengnan site is 500 meters to its No.2 location and there is a river between them. The main remains of the No.1 location are the cultural stratigraphy dating to the middle Palaeolithic period but only a small number of lithic artefacts were unearthed, including cores, flakes, blocks, cobblestones and a few tools, etc. Among the stone materials, most are vein quartz and quartzite, and a small number are quartz sandstone. These materials were procured from the bottom of the terrace or the river. The stone tools among the lithic artefacts unearthed are choppers, scrapers and axes with thin blade, and some small tools, etc. The Kengnan site was originally the No.2 location of the Kengnan Palaeolithic site and covers 2.5 ha. In the autumn of 2010, 24 squares with 5×5 meters area were laid at the No.1 location and the Kengnan site in sequence, the totally covering more than 600 square meter, including 225 square meter at the No.1 location and 375 square meter at the Kengnan site. The thickest deposit can reach 3.5 meters underground. The discovered remains at the site included six ash pits dating to the Neolithic period and East Zhou dynasty, one brick kiln dating to the Song dynasty and about 1000 lithic artifacts as well. In the spring of 2011, the Kengnan site was re-excavated and carried out in the area of 2325 square meter. Totally, the Kengnan site was excavated in 2700 square meter in two seasons. The discovered cultural remains included ash pits, cellars, pottery kilns and tombs, etc. Moreover, an area used for storing material was discovered and can be dated to the late Palaeolithic period. Also a few sites used for producing stone tools were found. The unearthed cultural relics include chipped stone tools, stone saddle-querns, pestles, flint, fossils of animal bones, pottery shards, burning earth and carbon dust, etc. The achievements of the archaeological excavations at the Kengnan site could be summarized into five sections in below. 1. The earliest pottery artefacts (burning earth, carbon dust) in the Han River reaches were found. The pottery shards are mainly sandy clay pottery in brown, including red-brown, grey-brown, less dark brown and grey pottery, but a few embryo are in red-brown, which were made in a low temperature. The sandy clay pottery is loose in material quality. In addition, the mixtures of the sandy clay pottery are mostly quartz grains and a little mica and clam shell powder in a few pottery shards. Among the mixtures, the quartz grains were natural sand grains added artificially. Moreover, the surfaces of these potteries are mostly plain but a few are finely decorated. Finally, these potteries are the earliest ones discovered in the Han River reaches so far. 2. Stone saddle-querns and pestles unearthed: the stone saddle-querns were in oval, square or irregular shape. Usually one surface of a stone saddle-quern is partly concave with corrupted traces and there are fine concave fillister in a few artefacts. 3. Flint artefacts and blades discovered: a numerous blades, flakes and small stone tools were discovered. These lithic artefacts were scattered distribution and flint is their material. They are irregular in shape and a few blades have thick spine with greater curvature. But those blades fine retouched in willow-leaf shape or with paralleling spines are rare. Either the small stone tools are scarce but typical in shape. They include scrapers, tip-like devices and stone drills, etc. Among these artefacts, most are by-products made in the process of stone tool production, including debris, flakes and blocks. Analyzing from the population, although blades are not the main products here, the chaine operatoire of producing the quartz artefacts was entirely retained. A large number of flakes with smaller size show the characteristics of the lithic industry in northern China. 4. The cultural remains dating to the transition stage from the Palaeolithic period to the Neolithic period were discovered. According to the excavation at the Kengnan site, there is no obvious difference in cultural connotation between the Upper and the lower cultural stratigraphy, which is basically dated to the transition stage from the middle and late Palaeolithic to the Neolithic period. The continuous cultural deposit in chronology and rich cultural connotation are ones of the characters of this site. 5. Lithic production workshop: according to the numerous of lithic artefacts unearthed from the Kengnan site, the Kengnan site should be a lithic production workshop within a long duration during the middle and late Palaeolithic period. The materials are mostly quartz, quartzite and quartz sandstone, and a little flint, etc. 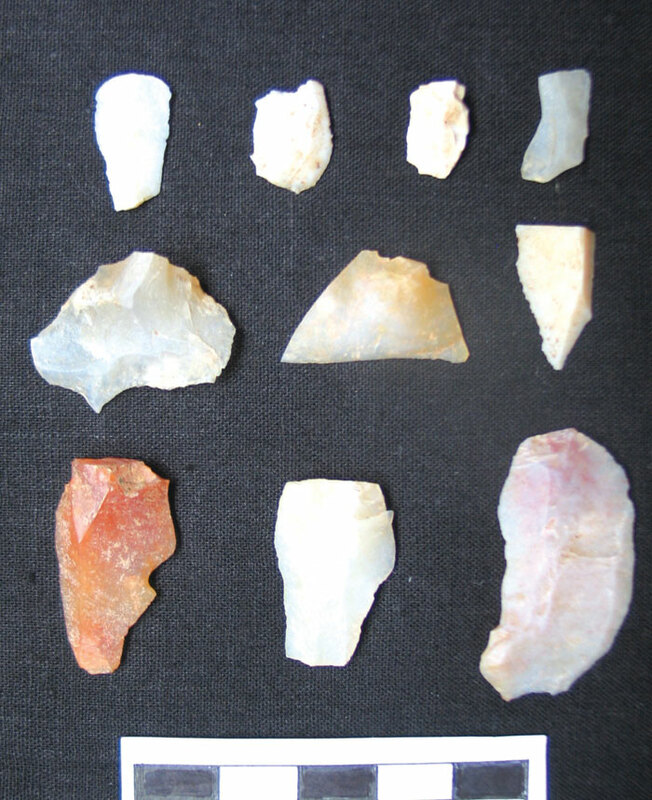 While, the types of the lithic artefacts are mostly flakes and the sizes are mainly small, but with a percentage of middle size. 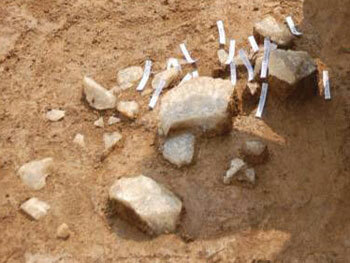 Moreover, cores, flakes, stone tools and stone blocks, cobblestones are the types of the lithic artefacts. In addition, a few groups of lithic artefacts can be spelled. Moreover, the hard hammer flaking was mainly used in the production and the direct hammer percussion was applied with un-retouched platforms of the cores. In summary, the stone tools were simple and rough, and the types are mainly scrappers and choppers, and with a little number of concave wipers, tip-like devices and drills, etc., showing the characters of the cobblestone industry in southern China. According to the types of the lithic artefacts discovered so far and combined with the soil structure of the stratigraphy, it was presumed that the fifth stratigraphic layer of the Kengnan site can be dated to 300,000 BP and the third and second stratigraphic layer can be dated to 10,000 BP, when the Palaeolithic period was transiting to the Neolithic period and the agriculture origins. Moreover, observing from the features of the pottery shards, it was considered that the pottery shard unearthed from the second stratigraphic layer can be dated to 10,000-9,000BP, which is a bit later than the Xinmi Lijiagou site but earlier than the first phase of the Wuyang Jiahu site.